PaperRules! Here, PaperWeek is in full swing in my lounge – current reading, my novel scenes on index cards, notebook and pen, and my Wall of Books. I spent a week focusing on paper for my creative activities: reading, writing, drawing, learning. Here’s what I found – the good, the brilliant and the rest. 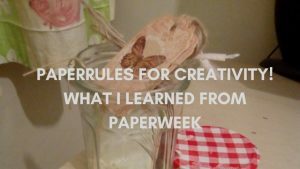 I am definitely going to extend PaperWeek into my life in general, because I feel it has helped me loosen up my creative muscles and look at writing, and imagination, in fresh ways. I learned so much about creativity and my overall verdict is – PaperRules! 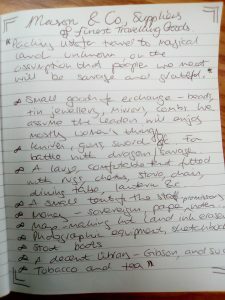 I gave myself a list of ideas for the PaperWeek challenge, and tried to tick off as many as I could. I didn’t have much equipment – an old lined exercise book, a Bic biro, and some blank index cards. That was basically it. I started with reading the Sunday papers, start to finish. That took two days’ worth of creative-time. I read two to three pages, then made notes or comments in my exercise book. Sometimes ideas leapt out at me. It’s not like online news, categorised by topic; in print, the articles are arranged by their supposed interest to the reader – meaning psychiatric crisis in hospitals was next to information about global warming and an exposé of a dating site for older men to meet much younger women. Put those three together in your writer’s brain and ideas begin to flow. Just for that experience, PaperWeek was worth it. 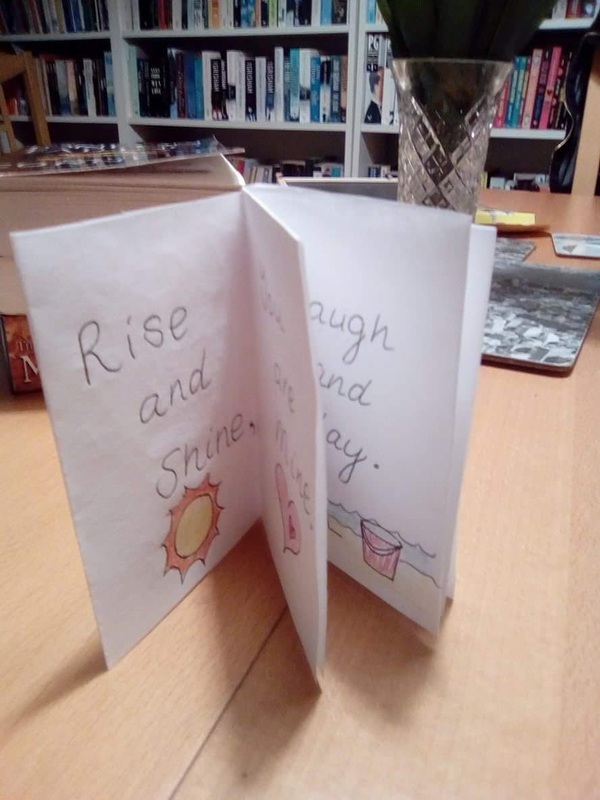 A poem minibook I made for my daughter. She loved it! It was disproportionately satisfying to be able to write Made by Mummy on the back cover with a flourish. I did skim the sports pages. (I usually just bin them, since I follow no sport of any kind.) The articles were all written in terms of epic battles involving Fury, Attack, Storm, Triumph – whereas the photos showed some men (and a very few women) competing for possession of a ball. Sports not involving balls were nowhere to be found. At the back were four pages of tiny print like the stock market news. It was intriguing. I wonder what else might generate such intense interest, in a fantasy setting? One PaperWeek challenge was to make a mini book. This I did, aided by instructions from the internet, and found it amazingly easy to create a minibook involving one blank sheet of printer paper, and one snip with a pair of scissors. I wrote a rhyming poem inside, coloured some simple illustrations, and hid it on my daughter’s pillow. She was thrilled, and loved the rhyme and the (extremely sentimental) words. I made her another one, even smaller, for when I had to travel away from home this week. She absolutely loved it and wants me to make more. So that’s a Mum win as well as a Creativity win. A postcard from an imaginary journey. Here, George complains of lack of handkerchiefs while the Wyverns close in. Next, a postcard from an imaginary journey. I made this quickly while having coffee at a service station, en route to Lincolnshire and a customer site. 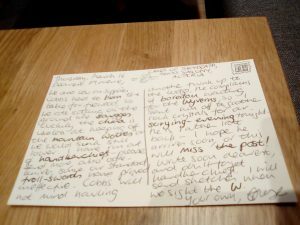 I’d grabbed an index card before I left, and whilst sipping my mediocre £4 Americano, I wrote a plea from an aristocratic beast-hunter to his beloved, requesting fresh handkerchiefs and complaining about the staff. This servant had disappeared when he was supposed to be watching out for Wyverns. I did my approximation of fancy Victorian handwriting (fake calligraphy is a thing!) and drew a stamp. In a very small space, I was still able to invent a scenario, a crisis, humour and an unreliable narrator who has no idea that the servant hates him and has run off, leaving the expedition at the mercy of supernatural creatures. Not bad for a six-by-four-inch space. I’ll be creating more postcards, and letters too, as part of my background project, the Journal of Imaginary Places. More on that another time. If I’d had more time, I might have roughed out this postcard first, then redrawn it in fancy ink, with a handcrafted fake stamp, postmark, and so on. But in fact, the speed and roughness of my creation was liberating. I already knew it could not be perfect, so I just went for it. That’s a big lesson from PaperWeek. 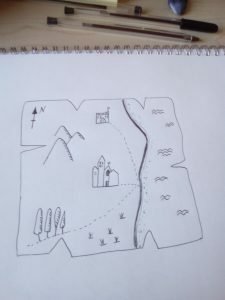 I am learning to draw fantasy maps, thanks to YouTube. This was my very simple attempt which I was nonetheless very pleased with. 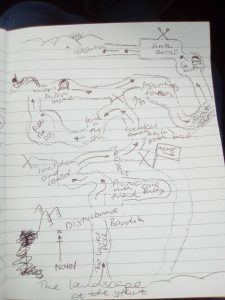 Next on my challenge list was to draw a map. I am rubbish at drawing maps, and have zero spatial awareness. I have trouble envisaging epic vistas in novels – in fact, trouble with location in general. I cannot seem to hold a big space in my mind. This may explain why I love scenes in cramped rooms, and shy away from vast fjords, plains, and so on. Anyway. I found a video on YouTube to create this simple map, and am disproportionately pleased with it. There are more videos – amazing videos – to create the kind of maps you see in Tolkien special editions – and I will be returning to map making for sure. However, my own fantasy novel does not need a map – or does it?? I also sought out paper visual input. 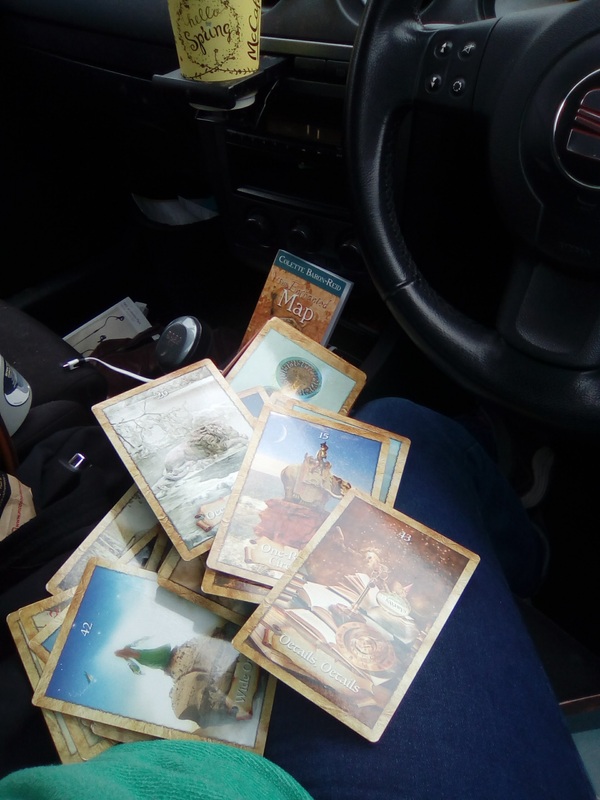 I have my WonderBook, but I also love the fantasy illustrations on these Oracle cards. One source of inspiration which I had overlooked was the purely visual – pictures. I look at a LOT of pictures online, of course – I think humans in 2017 live for pictures – but it was a while since I really looked at pictures in a book. So WonderBook has been an inspiration. (Separate post on Wonderbook coming soon.) I also love the art on these ‘oracle cards’ – a kind of daily inspiration set. The aim is to pick a card and read the little book. It’s similar to the astrology section in the tabloids – today is a day for new thoughts, cast off old ways, unless you already have, in which case, don’t. Basically harmless, and I love the art on this set. I’m not into tarot, but some of those sets have truly surreal illustrations, if you like that sort of thing. I need more fantasy art in my life, and not just online. Holding the art is a different experience. I can’t express that very well. But it may explain my greetings-card habit. Mini placard. 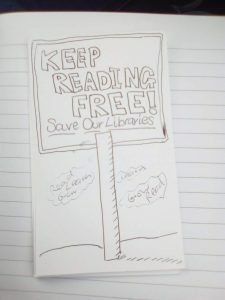 One challenge was to create a protest placard. I should write a protest song to go with it too. I could call it PapaerRules! A map of Bell’s novel structure. Visualising on paper helped me solidify the concepts in my mind. A separate task for this week was to conquer novel structure. For nine months, I have had tremendous trouble holding the shape of a novel in my head. (Not my novel – the theoretical novel as illustrated by Weiland, Lakin and Bell, plus others.) But now, egged on by PaperWeek, I was moved to draw a map of Bell’s structure, and it really helped. I will recreate this, so that it looks better and illustrates the structure. but as an idea and a memory exercise, this was brilliant. 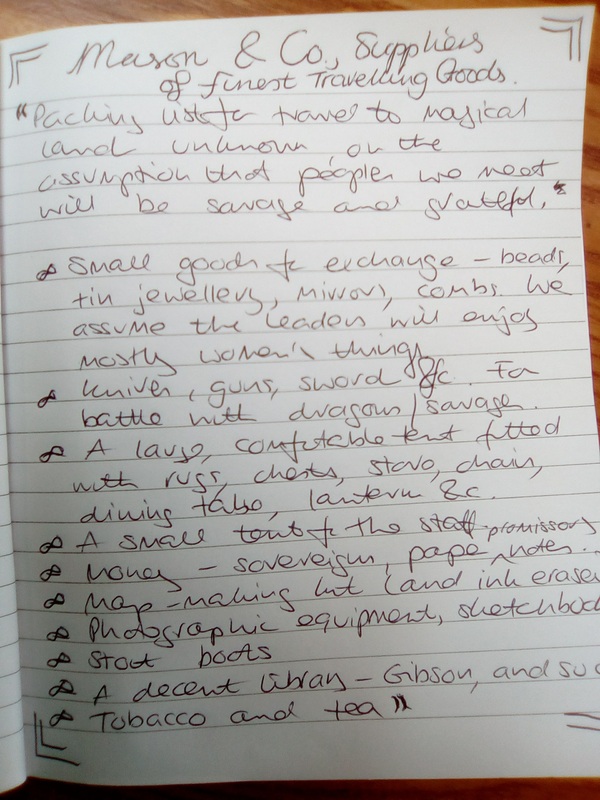 A packing list for a fantastic journey. Note the imperialistic tendencies of the traveller. Also on Bell and structure – I wrote my novel’s scenes out on index cards. I had already done this in Scrivener, and again in an exercise book (see the post on Backwards Planning), but putting them on cards has been helpful in matching my scenes to the three act structure. I have not yet laid them all out, but I’m in a hotel room for a chunk of this week so maybe I’ll have some time and floor space there. Prompt jar. I am writign down things seen in dreams, or phrases which strike me, or words I just like, for later inspiration. 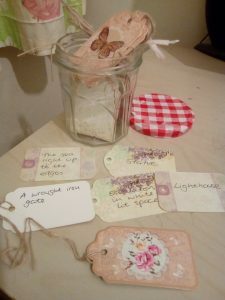 My last project was a writing prompt jar. For this, I caved in and puchased some readymade tiny tags, of the kind designed for scrapbooking and card-making. These I simply stuffed into an old Bonne Maman jam jar, and voila! a prompt jar. I have begun to write prompts on the tags – scenes from dreams, mostly, but more inspiration will come from Holly Lisle’s ‘Sweet Spot’ map. (There will be a blog post on the map soon.) 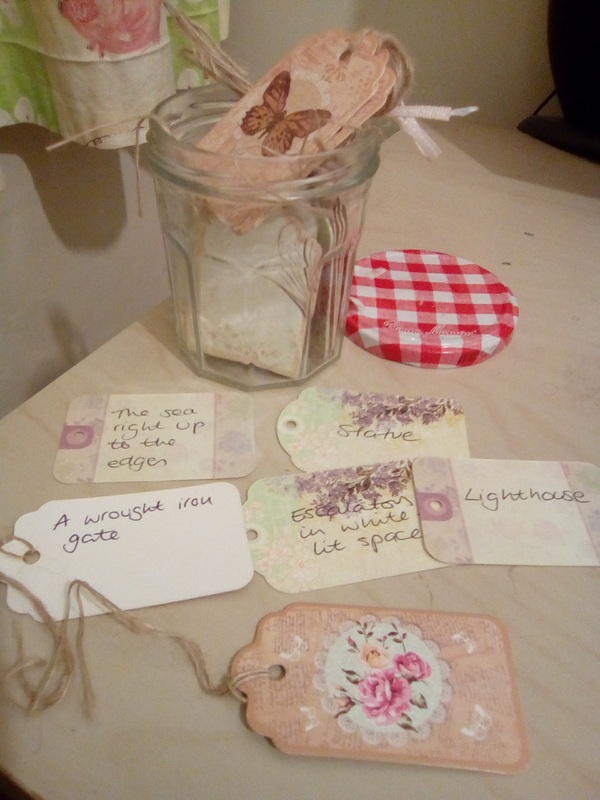 Anyway I love the look of the little tags in the jar, because they were made by people with colour printers, and we’ll see if I actually use it when I need a prompt. I created more than this – but overall, what a blast. I recommend a PaperWeek to anyone, especially if, like me, you spend far too much of your working life in front of a screen, and then continue the trend in your personal life, wrecking your eyes and your circadian rhythms. Working with paper forces you to take a screen break, and also jolts your creative mind into new ideas. PaperRules! Reading paper books helped me learn. Maybe I was channelling my schooldays, but it really seemed to make a difference when I read it on paper. Making notes and reflecting on my reading helped with… everything, especially learning and retention. Reading paper books gave me a lot less time for reading. 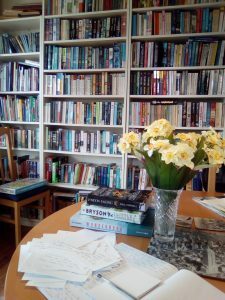 I do most of my reading on my phone in odd moments, and can whiz through a vast range of fiction on my Kindle app, plus news articles, craft blog posts, etc. I often read, and write, in a dim room while my child drifts off to sleep – not possible with a paper book. Reading paper books is way more expensive than reading Kindle. If I lived in a big city I would probably be able to satisfy fiction and non fiction with the library, but my town library, while pretty good (you know, for a FREE service), can’t stock the latest books in all the areas I read. And if I want something specific, I have to buy it. So ebooks are still king for giving me most value for least cash. Reading newspapers again after a deliberate break of about five years, has been great. It’s also an expensive habit though, so I’ll save it for the occasional Sunday, I think. Related: PaperWeek has made me appreciate the amount of free, quality content which is available online! Drawing and diagramming is a great way to solidify ideas. I knew this, academically, but it was rewarding to prove it for myself. Creating in paper was relaxing and freed my mind. I felt more imaginative after I made a tiny book or a map. I gave up so many other creative pastimes when I began focusing on writing, and I’ve been the poorer for it. I will make time for non-word-based creativity from now on. Commit to reading paper as your main source of news/fiction/nonfiction. Draw something every day, however doodlish and silly. Create art with paper – paint, draw, cut, stick. 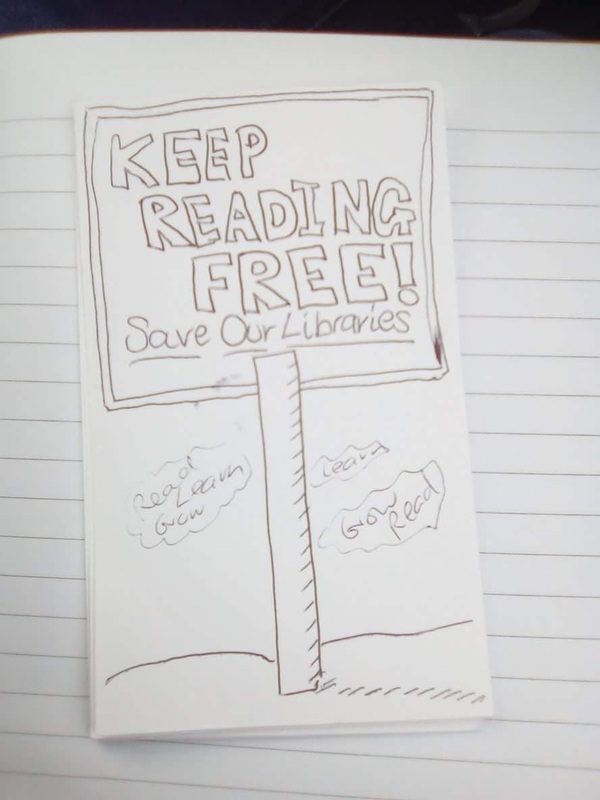 For more ideas see my full post on PaperWeek. Have you tried a PaperWeek challenge, or something similar? What did you find from the experience? Let me know in the comments!